Mesoscopic electrochemistry can be said to be a branch of physical electrochemistry at nanoscale and rigorously is a branch of mesoscopic physics in general, which is established as an interdisciplinary field that deals with systems of an intermediate crucial length scale. The scale of these systems can be described as being between the size of a quantity of atoms (such as a molecule) and of materials measuring micrometres. The lower limit can also be defined as being the size of individual atoms. At the micrometre level are bulk materials. Both mesoscopic and macroscopic objects contain a large number of atoms. Whereas average properties derived from its constituent materials describe macroscopic objects, as they usually obey the laws of classical mechanics, a mesoscopic object, by contrast, is affected by fluctuations around the average, and is subject to quantum mechanics. The propensity of molecules to transmit charge can be probed experimentally by measuring charge-transfer rate constants and molecular conductance in single or dual probe configurations. 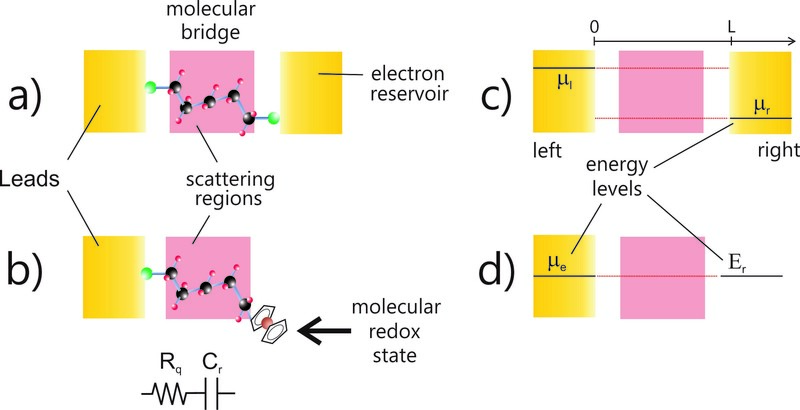 a) In molecular conductance measurements, the molecular bridge links two electrodes (the latter acting as electron reservoirs or sinks), each containing a large density of states. b) In electrochemical charge transfer, charge flows between discrete electronic states localized in the molecule to/from a high electrode density of states. Note that in b) the transport and electron transfer processes are governed by and parameters within an outlined mesoscopic description. The electrodes can be considered as “leads” and the molecular dielectric as a “scattering region”. In c) and d) the energy levels of the electrodes as measured in DC and AC mode, respectively, are depicted. The arrow in c) depicts the direction of electron flux in DC measurements under an applied potential difference (chemical potentials of left and right electrodes depicted by on left and on right, respectively). The length of the scattering region is . In AC measurements (where AC current is possible) the analysis can occurs at equilibrium , i.e. when the chemical potential of the metallic electrons equates to that of the redox state energy level, . (Paulo R. Bueno, Tiago A. Benites, Jason J. Davis; The Mesoscopic Electrochemistry of Molecular Junctions, Scientific Reports). Copyright (2016) Nature group. Our research group has specifically developed a mesoscopic approach to resolving the electron transfer rate associated with the electrochemistry of a redox active film tethered to metallic leads and immersed in electrolyte. The methodology is centred on aligning the lifetime of the process of electron exchange with associated resistance and capacitance quantities. Notably, however, these are no longer those empirically known as charge transfer resistance and pseudo-capacitance, but are those derived instead from a consideration of the quantum states. The averaged lifetime ( ) associated with the redox site occupancy, dependent on the scattering associated with quantum channels ( ) bridging them to the underlying metallic continuum, is defined and, in turn, associated with both quantum resistance ( ) and redox (electrochemical) capacitance ( ). These are related to electron transfer rate through . The proposed mesoscopic approach is consistent with Marcus’s theory and experimental measurements obtained by capacitance spectroscopy. The mesoscopic context of electrochemistry is fundamental to molecular and supramolecular systems, since they are essentially mesoscopic in character. The electron self-exchange, in case of energy fluctuations, or the electron transfer/transport, in case of the presence of an external driven electrochemical potential, between mesoscopic sites are energetically driven in a manner wherein the electrochemical capacitance ( ) is fundamental. Thus, the electron transfer/transport throughout channels connecting two distinct energetic ( ) and spatially separated mesoscopic sites is capacitively modulated. Remarkably, the relationship between the quantum conductance ( ) and the standard electrochemical rate constant ( ), which is indispensable in understanding the physical and chemical characteristics governing electron exchanges in molecular scale systems, was revealed, by following mesoscopic physics reasoning, to be related to , that is, . Accordingly, is the proportional missing term that controls the electron transfer/transport in mesoscopic systems in wide-ranging and equally it can be understood from first principles density functional quantum mechanical approaches. Indeed the differences of energy between states is calculated (or experimentally accessed) throughout the electrochemical capacitance as and thus constitutes the driving force for and/or , where is only a proportional constant that includes the square of the unit electron charge times the square of the number of electron particles interchanged.